In the world of fashion, the color black is considered the most versatile color because of its capability to be combined with any other bright colors – such as red, yellow, and blue. On the other hand, people could think that using these dark colors in your bathroom is too bold. 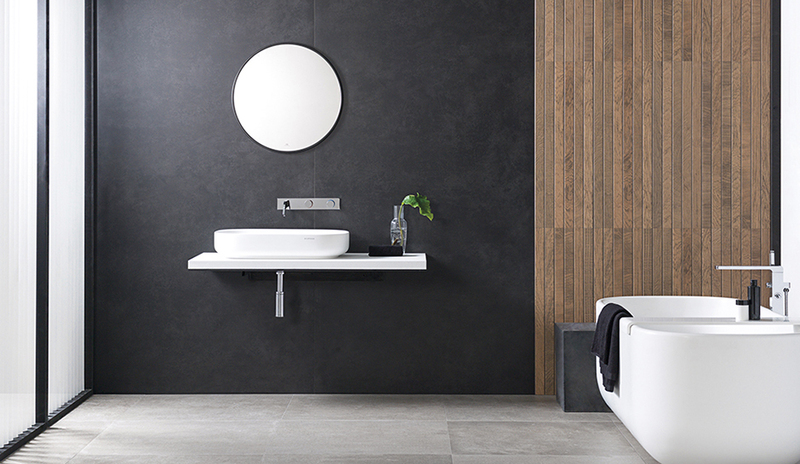 However, Porcelanosa has a selection of dark tiles can give your bathroom a modern look. Painting the walls of your bathrooms could seem like a wrong decision, but there is no need to panic because by using a set of bright colors, these dark colors will have an opposite effect and illuminate the mirror, bathtub, and sink – making them the focal points of your bathroom. 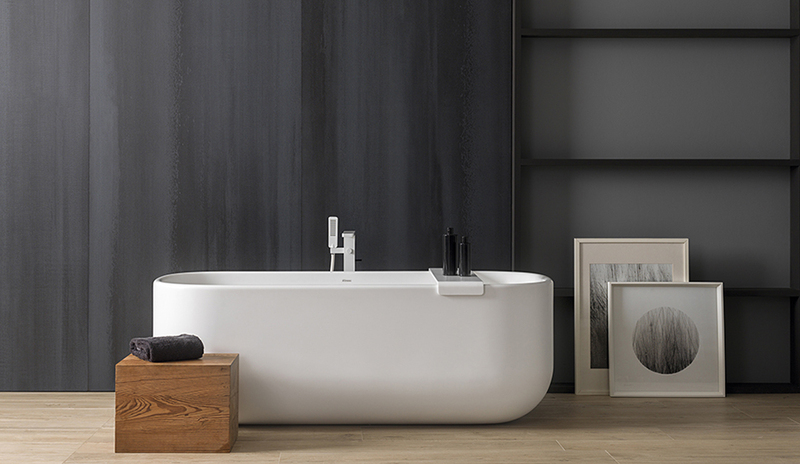 Porcelanosa’s XLIGHT tiles are a great product to use because of their large format size and light weight. They are easy to install, and can be installed over existing tile – allowing you to cover over your existing bathroom wall easily. 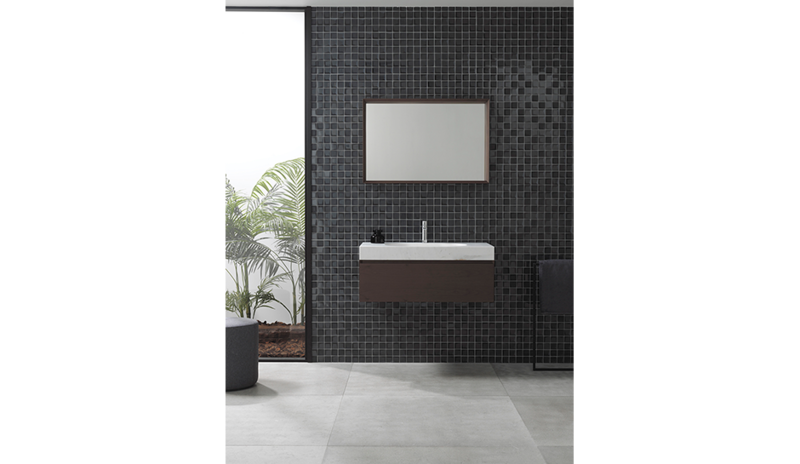 The contrast of a bright floor with the combination of the dark tiles will increase your bathroom’s range of color and richness in terms of textures and sensations. 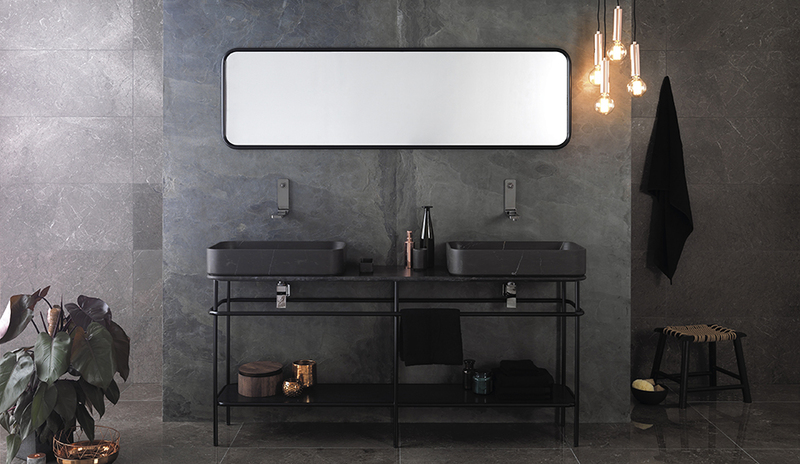 You can try using Liem Grey Polished, Stark Black Nature, Concrete Black Nature, or Nylo Black Nature to achieve this look in your home. Another product that can work well is Airslate. 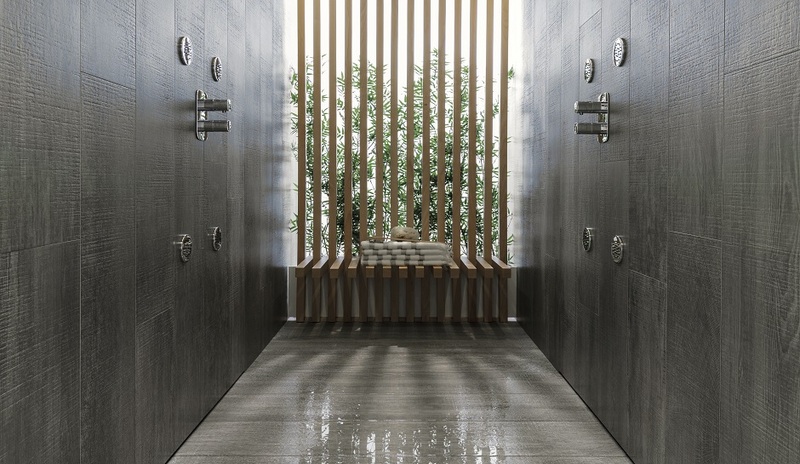 Porcelanosa’s Airslate is made out of natural stone, and is available in thin, large-format sized slabs. It is also incredibly flexible – making it an ideal product to use in renovations or uneven surfaces. 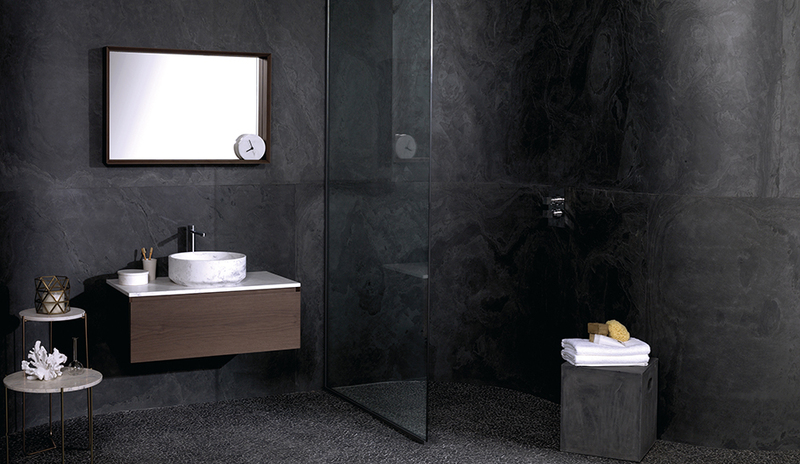 Airslate’s Graphite and Forest shades will add a touch of class, character, and personality to your bathroom. 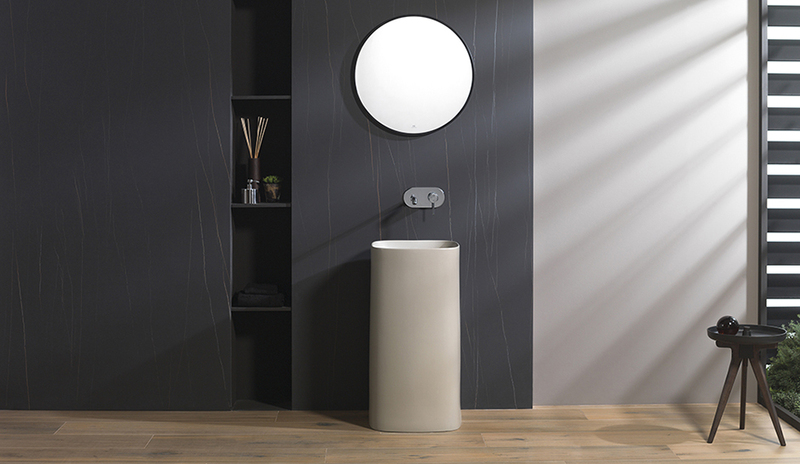 If you’re into a look inspired by wood, you can try any of Porcelanosa’s wood-look porcelain tiles from the PAR-KER® or Seedwood collections. 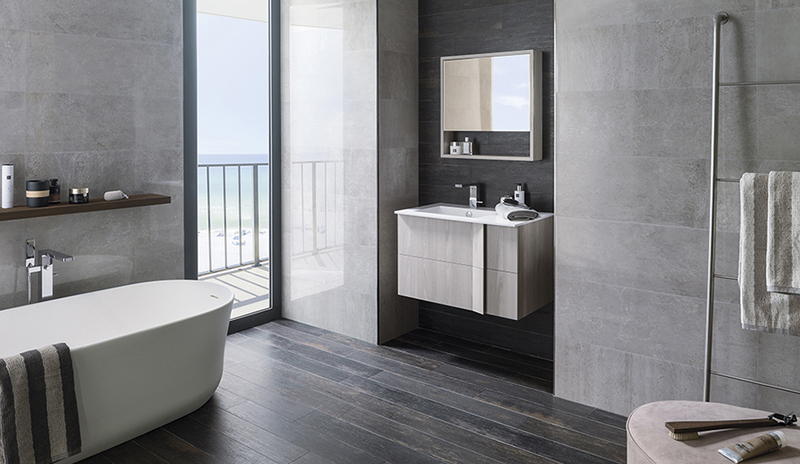 The rich, deep PAR-KER® Moy Moka or PAR-KER® Houston Taupe tiles will make your bathroom look radiant when natural light shines into it. 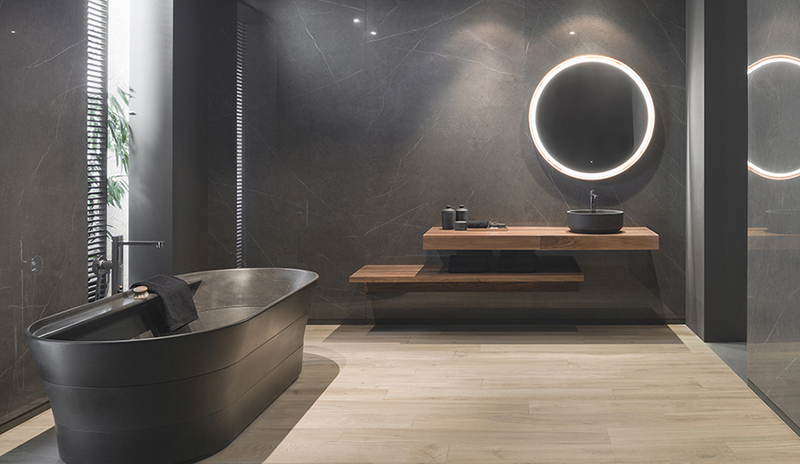 Visit any Porcelanosa location to learn more about these dark tiles and how to work them into your next project.